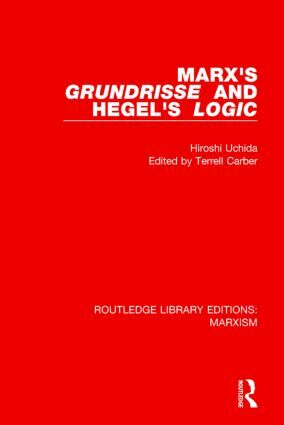 Marx’s Grundrisse is acknowledged as the vital link between Marx’s early and late work. It is also a crucial text in elucidating Marx’s debt to the idealist philosopher G.W.F. Hegel. This book, first published in 1988, is the first full-length study of that relationship, in a thorough textual analysis which makes the connections explicit and also the Grundrisse’s relations to the works of Adam Smith and Aristotle. This book argues that Marx’s critique of political economy, and his critique of Hegel, are double interrelated. Not only did Marx adapt Hegelian logic in order to analyse the economic categories crucial to modern society but it is argued that those logical categories were themselves seen as reflections of the productive processes of contemporary commercial society. Uchida reveals a conceptual structure common to the apparently rarefied world of Hegelian conceptual logic and to the supposedly common-sensical world of economic science. Demonstrating this is a considerable achievement, and it allows us to consider precisely what is valuable today in Marx’s critical commentary on this conceptual structure and on the type of society in which it is manifested. Uchida’s subject, like Marx’s, is ‘the force of capital on modern life’.